Did the holiday season sneak up on anyone else? I l glanced at the calendar today and couldn't believe we have less than two weeks until Christmas. Between opening our new Draper store, family parties, weddings, and company, the last month has flown by. If you are anything like us, you may find yourself hosting a holiday gathering in the next three weeks. Most of the time, these events are festive and welcome, filled with those people who make up the intricate weave of our lives; a time for laughter, friends, family, and of course, good food. Sometimes, however, the stress of planning and hosting these gatherings can overshadow the enjoyment. I've been there. Let me share something I have learned and implemented in our family that has really allowed me to fully embrace the joy of hosting during the holidays. It's simple. But it works. Do what brings you JOY. Then outsource the rest. No really, it's that simple. What are the aspects of hosting a holiday gathering that you enjoy the most? For me, it's baking delectable, fattening, sugary desserts. I also find a lot of fulfillment out of having 1, 2, 3, or all 4 of my boys in the kitchen helping. But maybe, for you, that sounds awful. Like curl-up-in-the-fetal-position awful. And that's ok! Maybe for you, the part of entertaining that brings you the most joy is decorating beautiful and intricate tables. Personally, I would rather gnaw off my right arm. But that is what is so great about this "secret' of mine. You just need to identify what makes you happy, and do those things. It doesn't have to be the same as mine, or your mom, or your best friend. Whatever is left? Outsource as much as possible. If you have an amazing lamb chop recipe and killer apple pie that you absolutely love to make, do it! Then, pick up a few appetizers and sides from your favorite restaurant to accompany your dishes. Love to "bake" but hate to "cook?" Have the main meal mainly catered then knock yourself out making desserts. A friend I know loves to cook, bake, and decorate. Her parties are fantastic. She used to stress for weeks, though, about her house. She loathes cleaning but is also meticulous that her house be "company clean" before guests arrive and it drove her crazy to see the mess the day after. Her solution? Hire a cleaning service to come in the day before the holiday party, then also the morning after. She says it is the best thing she ever did and allowed her to drop the stressful part of entertaining and just enjoy what was fun to her. Now, I may not be able to help you in the decor department (and we probably couldn't convince Verne to show up with a vacuum after the party), but if there are aspects of the almighty menu that seem daunting to you, please let us help! From appetizers and main dishes to pastries and decadent cakes, we have you covered. Let us cater your whole party, or just pick up a few fill-ins at our SLC or Draper locations. I sincerely hope that my little tip will help you enjoy hosting holiday gatherings, with none of the stress and all of the joy. 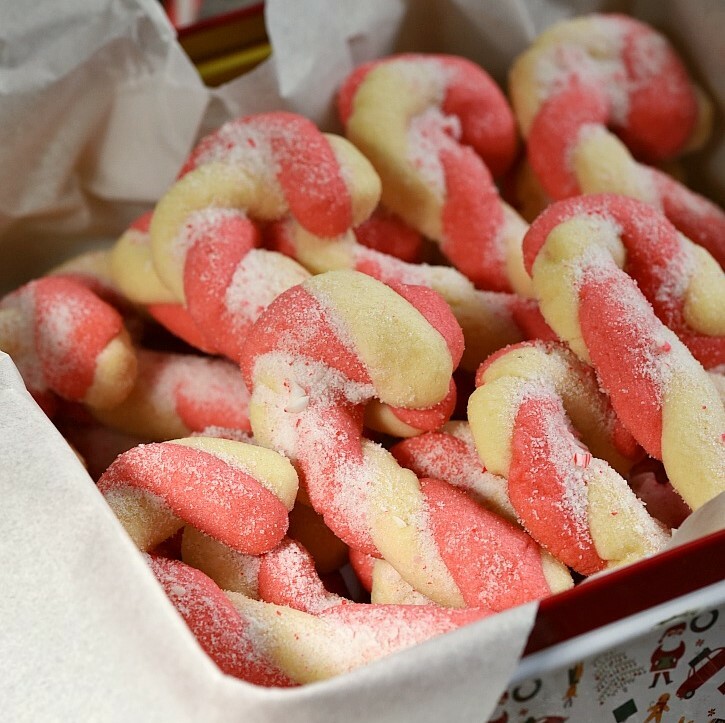 And of course, if you are like me and find joy in baking something sweet, you will find my recipe for our Gourmandise Candy Cane Cookies below. If baking these won't bring you joy, but eating them will...we also carry them in our bakery cases during the holidays. Just for you. Add to butter mixture and stir just until mixed in. Bake at 375 degrees for 8 minutes. When removing from the oven sprinkle with peppermint sugar (crushed peppermint processed with a little white sugar). Allow to cool about 5 minutes before moving to cooling rack. **I began to tint half the dough green; 1/4 red and leave 1/4 white since it was so much easier for you all to make balls for wreaths.